The inevitable finally happened yesterday. 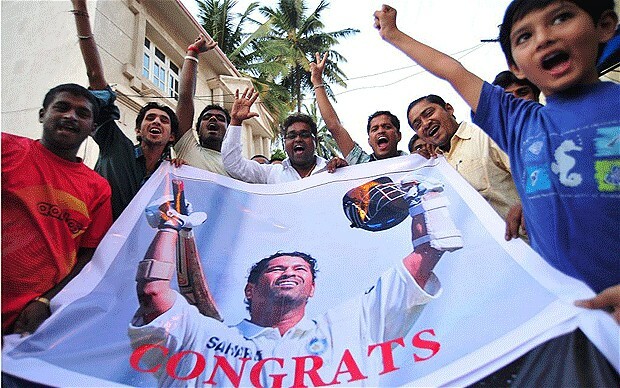 Yes, Sachin Tendulkar scored his 100th century yesterday, against Bangladesh. While the normal world was divided between, ‘C’mon…against Bangladesh?’ vs. ‘Bangladesh or Timbuktoo – this one century doesn’t matter. The collective 100 centuries is what matters’, one brand was thinking about how to make best use of this milestone to sound clever. Now, Twitter is a 2-way communication medium, unlike television…or billboards…or print. So, one gets almost instant feedback for anything attempted in the name of communication. At a quick glance, most reactions seem to be largely negative. Here are a few, as samples of the kind of opinions. The last one got retweeted more than 50 times, incidentally. 1. The ‘long awaited’ indicated that he took too much time to complete this century (indicating at the cost of the team’s performance, sometimes) and that we (people) should not delay our retirement planning like that. 2. That the tweet combines our retirement with Sachin’s – indicates that he should retire after this too. 3. It was opportunistic trolling – using a celebrated achievement for business gains. 4. It was plain spam – it was a silly, veiled attempt to ride on something popular, but with no meaningful connection with the brand. 5. It was lampooning a rival insurance brand’s brand ambassador. This is just the top 5 reasons I could gather from my research – the specific ones. And to think it sounded like a normal, gimmicky tweet! As I had posed via tweets too, if Bajaj Allianz’s idea was to be on everyone’s lips, I suppose it achieved the objective beyond doubt. But, for a brand, the 2nd part of that visibility may be equally important – are people who have Bajaj Allianz on their lips (tweets) positively disposed towards the brand? If you go by tweets alone, the brand manager at Bajaj Allianz may not consider so. This seemed like a problem with Dhanush’s follow up to Kolaveri too – the Sachin Anthem, sponsored by Boost. A majority (my impression) were seen to be underwhelmed with that attempt and were showing their displeasure via YouTube comments. But Dhanush, much like the Kolaveri craze, was intent solely on the number of views that YouTube video was raking up and was seen tweeting happily about it with his trademark ‘God Bless’. To me, this (and Bajaj Allianz’s ‘we’re on everyone’s lips, that’s what matters’ stand) seems more like a film maker saying, ‘All I want is my film’s release. I don’t care about what they think of it’. Or, a brand manager saying, ‘I just want my TVC out on television sets across the country. I don’t want to know what people think of it or my product’. In a 2-way communication medium like the internet (Twitter, to be specific), that sounds like shooting oneself in the foot. The dynamic of it being a 2-way communication medium brings its own challenges and behaviors over standard communication that one cannot really (merely) extrapolate what they do with other forms of 1-way communication media, into the internet. So, if your tweet can be interpreted in so many ways (5, to start with, listed above), the brand would perhaps need to spend sometime wondering if it is worth what they are after – mere buzz online…or, changing perceptions positively. Imagine – Flying Machine’s innuendo-laden print ads were in a one-way medium. If people were to outrage over it, they would be doing all alone, inside their minds. If the same was online, they’d see the ad, reactions by friends, reactions by strangers and mix all three to make up their mind. The same goes for Birla Sun Life’s recent TVC featuring Yuvraj Singh. While watching it on TV, I merely ask a question to myself, inside my head – isn’t that awkward timing? But, after watching it, I log on to the net and am bombarded with opinions from multiple sources – Facebook status updates, tweets, blog posts etc. where some of them seem to mirror my thoughts. So, even if I was on the wall on this, my opinion may be swayed by the most persistent opinions online. To a large extent, people, even if they didn’t have any opinion towards Balaj Allianz’s tweet, may have been swayed by the majority opinion that was being aired all over the net. This may be due to fear of criticisms or just a feeling that this doesn’t warrant further thought and what people seem to think overall is what matters. But again, does it mean all brands (and us, people too) need to be stiff, boring or predictable online? Or, do all brands choose the ‘safe’ route and not say anything that ‘may’ antogonize a section of the population? Of course not. There are many brands that take a polarizing stand on many things – Axe does, by being blatantly sexist. Amul does, by milking its communication timing (safely – usually) with real like incidents. But these brands have chosen this stand as a positioning platform and not as a one-off gimmick. I’m sure when Axe aired its first ever sexist ad, it may have been under a cloud, if it was online, but subsequently (and consistently), when people see that association, they come to understand that it is a positioning stand they have chosen and that there is a large enough target segment that continues to appreciate that stand. Bajaj Allianz isn’t perhaps known for such a stand yet and is probably paying the price for starting one, at least so far. Who knows – if they continue this tongue and cheek humor that sits on the wall, may be they can build an image for themselves along these lines. But, whether that helps the brand in some way or if it is a chosen positioning for the brand is a moot point. Understandably enough, Bajaj Allianz apologized twice, yesterday evening – the first, an hour later, seemed more like a reaction to the mounting criticism. The 2nd one, that came 2 hours later seemed like a carefully planned strategy to milk the gimmick – it included 2 brand-related hashtags too! Is Instagram’s Boomerang the next social media content factory for brands? Why I Want Google Plus to Bomb?